You can now create your own custom-embroidered U.S. Air Force Ball Cap. 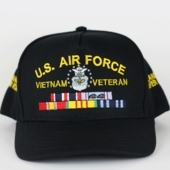 Your Unit, Rank, or Specialty Badge can be direct embroidered on the front of the cap with lettering above, up 6 Service Ribbons can be embroidered below the center insignia for an additional cost of $3.00 per ribbon. Limited lettering can be placed on the left and right side the insignia. All caps are premium quality and are MADE IN THE USA. All cap designs adhere to the same traditional Military designs that are still in use today.